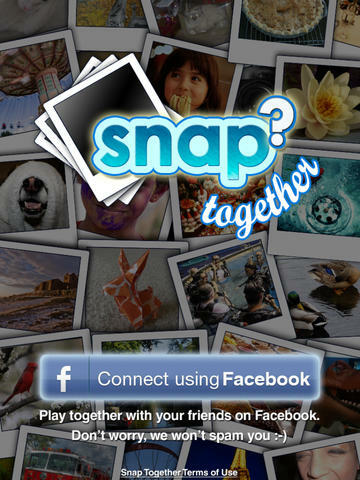 Play Snap Together, a simple, easy-for-everyone social photo guessing game for your smartphone. 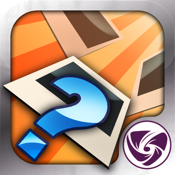 Create, guess and share your photos in the most enjoyable way. Making pictures has never been this much fun. Download Snap Together for free and start sharing photos with your friends today. ★ Playing Together is more fun! 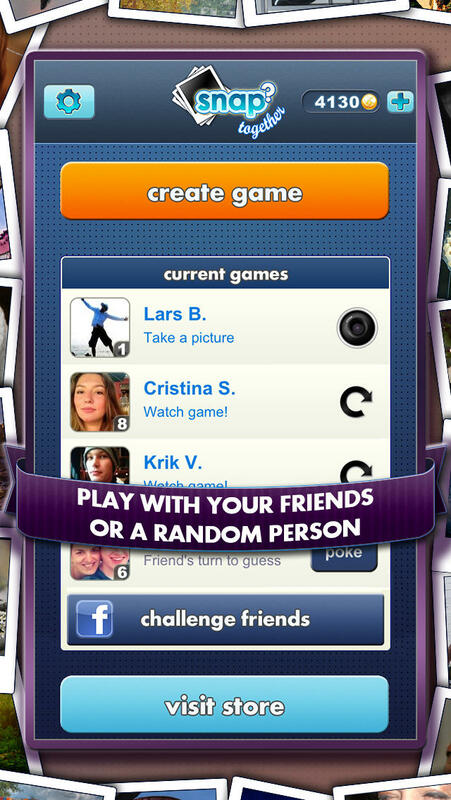 Play with your Facebook friends. It’s more fun this way! Don’t worry, if you don’t have any online friends, we’ll hook you up with someone just as cool as you! Asynchr-what? Well, it means that you take turns guessing and taking photos with your friend. Put your phone away when it’s not your turn and pick it up later when you have time. This game relaxes you, and we’ve heard it’s good against the flu too! If things are getting too relaxed, you can ask your friend to hurry up by sending a push notification. You can also get one when it’s your turn, free of charge. A self-aware machine in our basement figures out which words are the most popular, ensuring you only get to pick from the best words our dictionary has to offer. Think you’re better than Bertha? You can play with your own words too. Pics or it didn’t happen! Sometimes we run into unique situations. Capture the moment and add your own custom word, so you can share your jaw-dropping adventures with your friends in the most enjoyable way. It would be a shame to let those beautiful photos go to waste. Luckily, you can share them on Facebook and Pinterest so even your most distant online ‘friends’ can see how awesome your photography skills are. ★ There is no price for loyalty! We constantly update the game with new features and other improvements, and we don’t require you to pay us even a dime. Don’t keep us a secret, share us with the rest of your friends!